1 the distance between emitters can be varied to meet the irrigation demands of different crops so that it can save water and increase output to the largest extent. 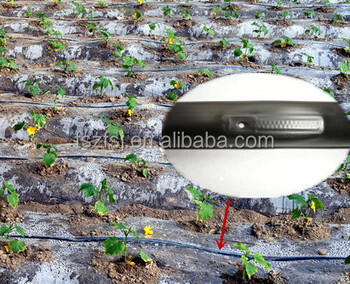 2 special labyrinth type design on emitters makes users control dripping quantity through water supply pressure according to actual water quantity needed by the crop, and make dripping volume even for each emitter on a fixed length. This production line is used to make mosaic flat emitter type drip irrigation tape .The mosaic flat emitter type drip irrigation tape is widely used in the field (cotton,etc. )vegetable and fruit, trees and flowers.